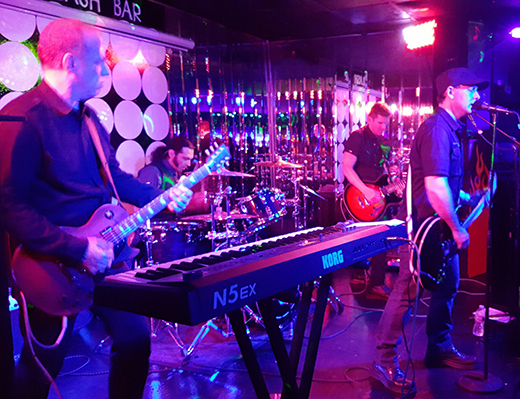 Singer and multi-instrumentalist Christian Dryden hosted a particularly spectacular night of cover band performances at the Clash Bar, a nightspot famous for exceptional entertainment in the punk genre. Most all my readers are familiar with this venue, noteworthy for its well-stocked bar, reasonable pricing (both entry charges and libations), great shows and the friendly supportive management of that patron of the punk arts, Bob Clash. Openers Pulp Flannel served up a nostalgic mix of 90s grunge rock – Seattle style – with covers of Nirvana, Smashing Pumpkins, Alanis Morrisette, the Cranberries, et al. They took a while to warm up and their performance was somewhat uneven with regards to quality and authenticity. However several songs, female-fronted by the adorable Kitman, really hit the emotional bulls-eye for us aficionados of pre-millenial alternative rock. Kitman also happens to be the name of a famous Hong Kong songstress to whom Pulp Flannel’s vocalist bore a striking resemblance, though decades younger. Disorder takes up the challenges posed in paying tribute to the oeuvre of Joy Division, whose iconic status attains to heights approaching mysticism for having ushered in the prolific era of Post-punk. There are other Joy Division tribute bands, but it’s hard to imagine a more perfect capture of the dark, enigmatic ambience of this archetypal band than that achieved by Disorder. Not only did they pay tribute to Joy Division’s beloved standards like “Dead Souls” and “Love Will Tear Us Apart,” but also they dug deep into their repertoire including such lesser-known gems as “Warsaw” off the “Substance” album. I have followed this combo ever since I adopted Joy Division as my religion, and I have seen the guitarist, John Costa and bassist David Id attain ever higher levels of skill in perfectly reproducing the sound of the original albums and the feel of the few surviving live performances. Vocalist Mike Strollo and percussionist Chris Mele bring a level of obsessive professionalism to the task of reproducing the experience of this tragically short-lived yet monumental band. The night concluded with the KISS tribute band – The Flaming Youths – in full black & whiteface make-up, and organizer Christian Dryden sat in the esteemed position behind the drum kit for hard rock covers of the infamous 70s & 80s idols. Opening with the typically feel-good “Deuce,” Flaming Youths proceeded through a thirteen-song set and concluded with the emblematic “Rock’n’Roll All Night.” They touched upon and delivered the best of KISS’s mother lode of defiant party anthems, a perfect culmination to a night of tribute to rock music’s ancestry.